Looking for the "middle/high school" edition of our Composition & Photojournalism course? It's great! Click here. 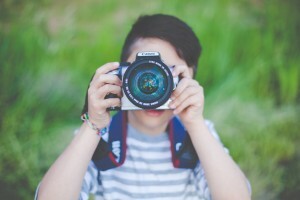 Does your child love to take pictures? Do you have a young artist in your home, but aren't sure how to encourage their talent or their enthusiasm? This class was created specifically for your elementary aged photographer! Complete with lessons, hands on activities, and step by step shooting assignments, this class is designed to give your child an understanding of basic visual art composition. Your student will learn how to see and arrange the elements in their surroundings and create interesting and captivating images! This course DOES NOT require the student to have any specific kind of camera. They can do this course with a dslr, point & shoot, even a phone camera, whatever they have available. Here’s how the course is set up: There are 7 photography lessons, each teaching a key concept of composition. For each lesson, there is both a written version, complete with plenty of photo examples, and a video version provided. The videos follow the written text and are presented by Ernie Treu, the creator of the Foto Finch courses. Your child can read, watch, or do both - whatever fits their learning style best! Each lesson is followed by a hands on activity. These help to solidify the lesson concepts. As with the lessons, there is both a written and video version of the activity instructions. Activity videos are presented by a fictional character named Haymish, a very proper Scottish coyote puppet specifically created for use in the Foto Finch courses! Haymish is a fun and personable canine, and will undoubtedly become one of your child’s favorite parts of the course! Lessons and their corresponding activities are followed by one or more shooting assignments (16 in all), designed to help your child take the information they read/see and put it into practice behind the camera. The suggested rate for going through the course is one lesson and activity or one shooting assignment per week, giving you a total of 23 weeks of material. However, your student may move through the exercises faster or slower. Find a pace that will work for your child, that encourages them to do the work consistently and enjoyably. The course is currently being offered as an immediate digital download (of all written material) with online viewing of the lesson and activity videos. Once purchase is complete, you'll receive an email with download information as well as access to the Foto Finch Members Site where your student will be able to watch the videos and go through the course at their own pace. Want to take a closer look? Check out the samples below! Keep an eye out for our upcoming Photojournalism course for elementary aged students! Set up in the same format as this Composition class, it will help young photographers learn to capture the story in front of them and tell it with their images!